The first thing we did was put on our shoes and shin pads while Mr Dowson was talking to us. He was telling us strategies on football against them. I was in the D team but some people were in the A, B, C and E. All the teams lost but we really had fun and loads of the Mums and Dads came to support us. 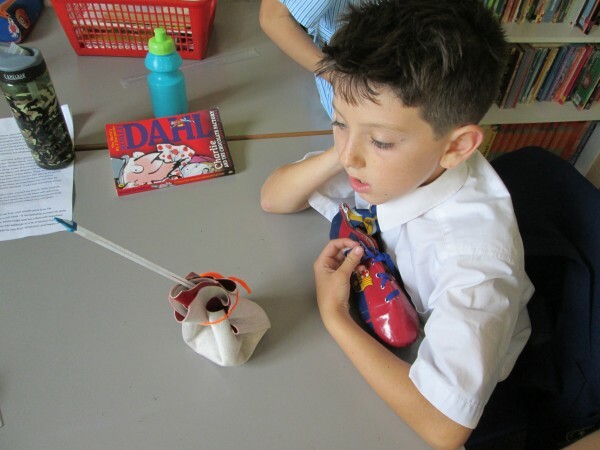 Year 5 Science Experiment by Oscar. On the 27th of September, Year 5 did a Science experiment to see which was the best material to make a lunch box. The materials we tested where: Fake fabric, fake leather, tin foil, rubber gloves and wool. The experiment worked by using ice cubes as food then wrapping them up in each of the materials and putting a thermometer next to the ice inside the materials and then seeing which material kept it coolest the longest. Last week and this we learnt about column method, number line method and partitioning. At the beginning of the week set 2 maths started the early week with partitioning, after 2 days we moved on to the number line method. It was all fun because we could choose in what group we would be in and when we were stuck the teacher could help us. It will stay in my head because we did a really good test about all the methods. My favourite method was the column method because you could borrow and add the biggest numbers together. Open Day was very exciting because I got to show new people around the school and welcome them happily. I felt happy at the end. I went to different rooms around the school such as Reception to Year 2. It was all the teachers from each year. I recommend all the children to the school and they will welcome you with open arms.